Get our guide on how to craft the ultimate burger experience! At first sight and first bite of every well-crafted burger is the bun. Proudly presenting your carefully chosen ingredients, EuroBake® brings innovative new artisan bun varieties that, like our full line of classic artisan buns, are crafted in authentic European tradition to elevate every element of burger bliss. Create the ultimate burger experience! Download our guide on how to create the ultimate burger experience, to make your menu stand out! The all-new celebration of "Burger" and Beer. 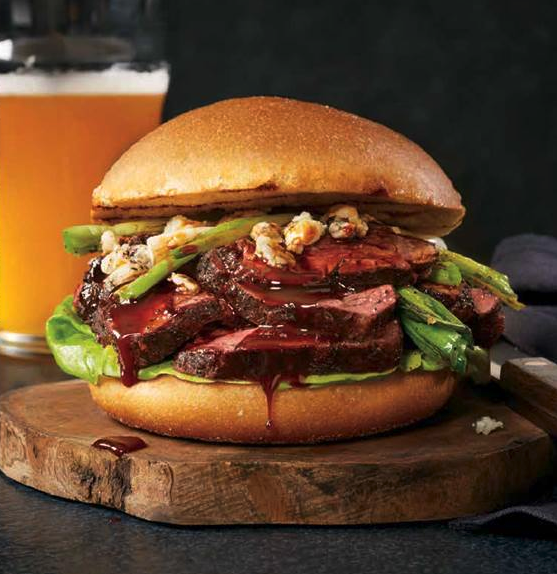 A steak sandwich plays up the craft beer trend featuring hand-carved cocoa rubbed hanger steak drizzled with craft beer-infused demi-glace sauce on a soft yet sturdy brioche bun. Crumbles of gorgonzola cheese and charred green onions finish the layers of flavor in this premium build. Consumers rate protein as the top reason in ordering a particular sandwich - 69% - they also consider the bread nearly as important at 64%. Operators that want to stand out with gourmet sandwiches will consider these two elements first. 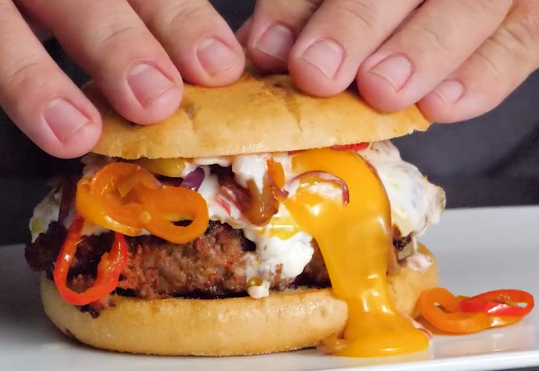 This is the chorizo and egg brunch burger with onions, peppers, and queso sauce on a Euro-Bake Hatch Chile bun. Fill in your information and we will give you a call within 24 hours to discuss your burger options, so that you can build burger bliss for your customer!